For some students, high school is about going to pep rallies, studying for exams and getting a diploma. For others, such as Ahleah Harris and Halle Arneson, high school is so much more. They are both involved in the Minnesota Trades Academy, a paid summer internship experience for Twin Cities-area youth. The program’s goal is to introduce young people to careers in construction and help them develop the skills they need to earn high-paying, fulfilling jobs. This summer, Ahleah and Halle participated in Track I of the Minnesota Trades Academy internship. Track I interns receive a comprehensive introduction to construction career opportunities and learn the basics with expert guidance. Ahleah, 17, will be a senior in the fall of 2018. She is involved in Central High School’s badminton club. She also participated in College Possible, a college and career preparation program, and serves on the Student Council executive board for social action initiatives. Halle, 16, will be a junior in the fall, and is also involved in Central High School’s badminton club. Last spring, Ahleah and Halle took Central High School’s woodworking elective course. During the course, Sam Ebute, director of the Minnesota Trades Academy, spoke to the class about the Minnesota Trades Academy summer internship opportunity. Over the last few weeks, Ahleah and Halle have been constructing a tiny house and a playhouse with a group of 11 other Twin Cities-area high school students. They get to give back to their communities by giving someone a home, while obtaining work experience at the same time. “My friends think it’s really cool that I’m doing this,” Halle adds. Minnesota trades unions are applauding Ahleah and Halle’s summertime learning experiences. Terri Stave, business representative for International Union of Elevator Constructors Local 9, met with Minnesota Trades Academy interns this summer to answer questions and introduce them to the elevator construction trade. 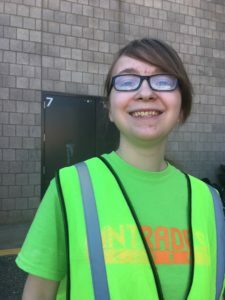 “It’s so important for young people to get involved in programs such as the Minnesota Trades Academy, and learn about their career options,” Terri says. 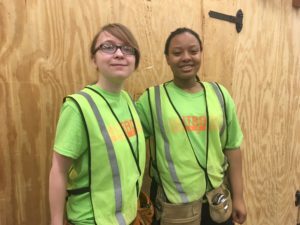 According to Terri, young people, such as Ahleah and Halle, need to take advantage of programs such as the Minnesota Trades Academy. By starting early in learning skills that can be applied to any trade, they can get a leg up in building a rewarding career. While Ahleah and Halle are learning advanced technical skills as they construct a tiny house and a playhouse, they also are learning problem-solving skills and how to be patient in difficult situations, such as incorrect dimensions for the playhouse walls. 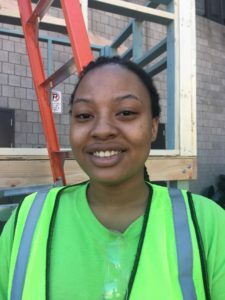 With every problem they solve with their team, Ahleah and Halle are finding that construction is an excellent career path for women, a typically underrepresented group in the construction industry. Terri acknowledges the value of union construction careers for women. 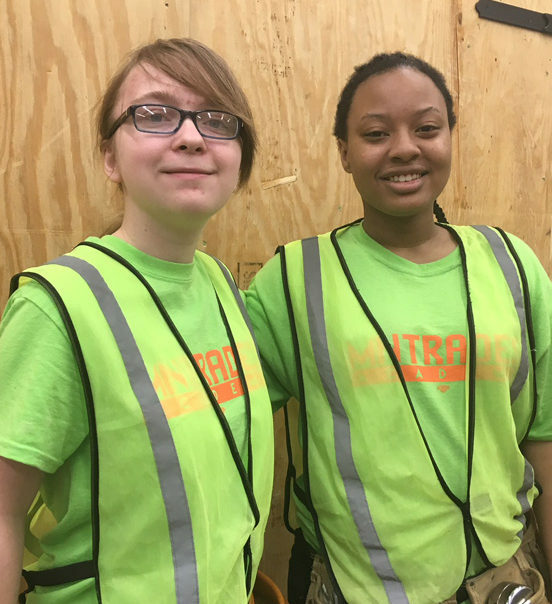 While Ahleah, Halle and Terri are all changing the game for women in construction, Aleah and Halle are also aware of the impact they are making in their community as Minnesota Trades Academy interns. 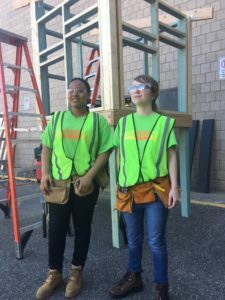 Halle and Ahleah agree that they would do the program next summer if they had the chance, and have a few words of wisdom for anyone thinking about applying to the Minnesota Trades Academy. The Minnesota Trades Academy is supported through the generosity of the following organizations: Apprenticeship Coordinators Association of Minnesota (ACAM), City of Minneapolis/STEP UP Program, City of St. Paul Facilities Department, City of St. Paul/Right Track Program, City of St. Paul/HREEO, Kraus-Anderson Construction, M.A. Mortenson Co., McGough Construction Company, the Minnesota State Legislature, Minneapolis and St. Paul Building and Construction Trades, OPUS Foundation, PCL Construction, Ramsey County/U LEAD Program, Ryan Companies, Saint Paul Police Department, St. Paul Public Schools, and White Bear Lake Area Schools.